There’s a missed call on my phone this morning and I figure it’s another one of those stalkers from the phone company trying to squeeze more money out of me. But guess what? It’s not! When I check my voicemail, it’s the nice lady from my local newsagents telling me I’ve won… an all singing, all dancing and all chopping food processor! Yeeha! I’m so excited I could wrestle an action man! The last time I won something, was a big teddy in a raffle at high school, so this little lucky moment, has been a long time coming! When we bought our Mother’s Day cards, I couldn’t resist entering the free draw for the food mixer, (I’m a sucker for free stuff!) and then promptly forgot about it! So it’s such fun to get some good news! Of course, I can collect the machine at my leisure, but I’ve never been known for my patience! I make a mad dash to the shop to collect it right after work. The nice man at the newsagents offers to carry it to my car. Car? Bah! I don’t need a car, I’ve got muscles! The machine is a monster and I certainly get a workout carrying it home. It’s a mega machine, but it’s also a redundant one, as I already have a food processor that I know and love! It’s worth quite a stash of cash so I’d be silly not to sell it! 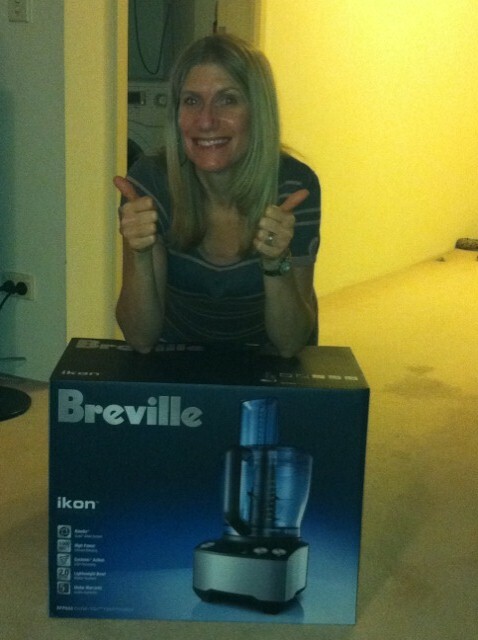 And best of all, the cash I collect from the sale, can go into my Thermomix fund!